The weather is turning, at least down here in the south of England, it must be almost weekend. It still seems to be holding on Islay though. Having played a bit with Google Squared earlier this evening (probably more about that tomorrow) it's now time for this week's Friday Islay picture. 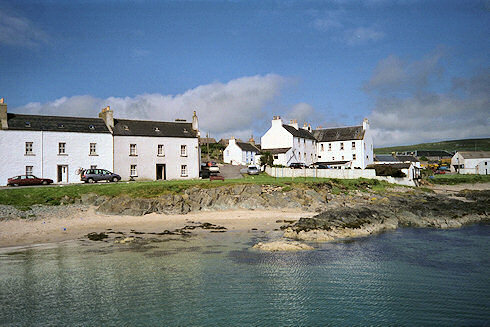 This is a view of Port Charlotte in 1999. There's a reason I've picked this picture: In case you don't visit the Islay Pictures photoblog, I've been running a series of Islay pictures from 1999 on it this week. The larger version (larger as in more than twice as big) will be added to the series tomorrow morning as usual. It was quite interesting to go through those almost 10 years old pictures. The ‘nature’ views are basically unchanged (apart from normal natural changes like erosion), more interesting were the subtle changes in some of the buildings. An example: Looking at the large Laphroaig lettering at the Laphroaig distillery warehouse I noticed that there was a ® painted on the wall in 1999, at some point this disappeared, it's not there any more now. I'll leave you to spot any other differences, have a great weekend whatever the weather and whereever you are!